This post represents the final installment in the series detailing the first of our three cross country National Parks camping trips with travel trailer in tow. As our family pulled out of the Riverview RV Park in Loveland, Colorado, early one August morning in 2007, we could look back at our itinerary and take great satisfaction knowing that we had achieved our goal of visiting one National Memorial (Mount Rushmore), one National Monument (Devil’s Tower), and five National Parks (Badlands, Glacier, Yellowstone, Grand Tetons and Rocky Mountain) on our first cross country trip as a family of four. Alan and I pretty much re-created our honeymoon of more than 25 years prior, the only differences being that a travel trailer had replaced our two person mountain tent and there were now two kids in the previously empty back seat. The trip had been full of many “firsts” and tons of fun but, initially, we had been extremely disappointed that we would miss a visit with our friends Mary and Dave who live in Colorado. If you remember me mentioning our close friends Peg and Bill who live in Virginia, you may be interested to know that Mary is Peg’s sister. Since Peg and I have been friends since first grade, it follows that Mary and I have known each other for quite some time, as well. Although Mary is younger by several years, she and her husband Dave had children before Alan and I did. And I have to say that we have looked upon these two incredibly warm and caring people as role models while tripping our way through the landmines of parenthood. Years and years ago (and Mary could probably tell you not only which year but, most likely, the date and time, too) we enjoyed an afternoon of boating on the river with Mary, Dave, their two precious little daughters and Mary’s Dad. The two sweet kids enjoyed the adventure and proved to be passengers that any ship’s captain would be happy to have aboard. And, of course, they were just delighted to stop for ice cream after docking. How many young siblings do you know who, having each just had the first lick or two off their soft serve cones, would extend those cones to each other with lots of encouragement to “taste mine?” Not many, right? These two young ladies didn’t hesitate for a second and it was then and there that we knew Mary and Dave were taking this parenting gig very seriously and doing an excellent job at it. The two of them continued their parenting wizardry throughout the years and today those two "little girls" of theirs are just as close and cheerful as ever. One is happily married with two young children of her own and the other is soon to be happily married with a summer wedding on the calendar. Because their family is all about fun, family and friends, we love to connect with them whenever we’re able to. Since there are six fairly large states between us, that doesn’t happen nearly as often as we’d like. Originally, we were so disappointed to find out that Mary and Dave would be traveling in the Midwest while we were on our cross country trip, so there was no chance of stopping for a visit at their home in Colorado. But Mary is the Queen of Making It Happen and, with a little juggling of routes on their end and ours, we were able to meet in the middle of . . . nowhere. Well, not really nowhere. But in the middle of nowhere we’d ever been before. 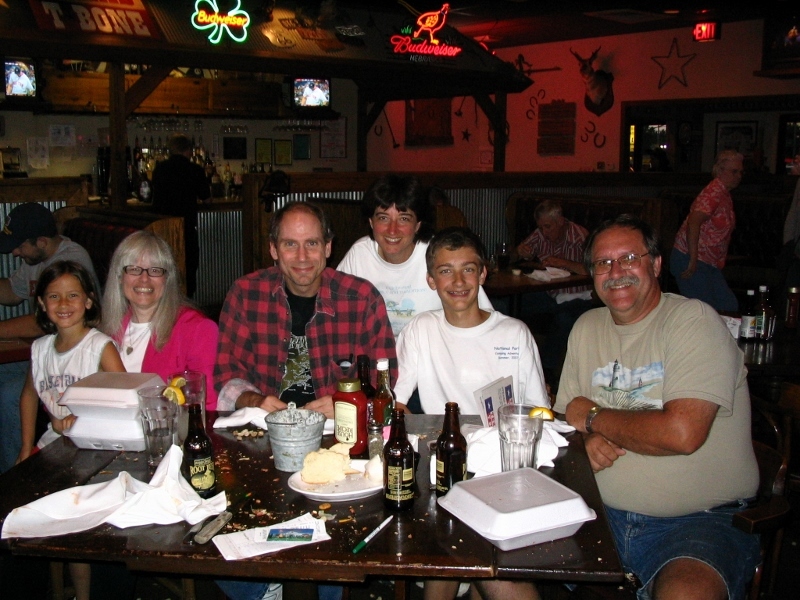 The Texas T-Bone Steakhouse in Grand Island, Nebraska, would prove to be the perfect spot to get together with our old friends. It’s a roadhouse, with buckets of peanuts and plenty of shells on the floor, and just the kind of place where you could be a little rowdy without the risk of getting thrown out. (Don’t forget, we had our kids with us and needed to set a good example. Dave and Mary had no such restrictions, but we knew we could trust them not to lead our two very far astray.) I cannot recall the food at all (except for the peanuts, the shells of which seemed to be flying six ways from Sunday all around us - so much for the good example) but I can recall the camaraderie, the fun, and the wonderfully warm pleasure of sharing a special evening with good friends. By the way, many other people must be enjoying the food because, when I looked on TripAdvisor when writing this post, the restaurant is currently rated #1 out of 109 restaurants in Grand Island. So, we done good. Just sayin’ . . .
Good times at the T-Bone! Although we don’t see Dave, Mary and their daughters regularly, these are the kind of friends who you just pick up with wherever you left off – no pauses, no awkwardness, just delight in being together, catching up on family news and having some good old fashioned fun. In fact, it was this family who taught the four of us how to play “The Cup Game.” Go ahead, look it up online; I’ll wait. Actually, there are some excellent videos with instructions, including this one: link HERE. If you can imagine a crowd of people gathered around a large table trying to play this game with half of the participants being complete newbies who have no idea what they’re doing, I think you’ll get the picture. So much laughter, so much fun. (You guys are the best entertainment going!) It was no surprise to us that Mary became a Certified Professional Coach who, through her company called Pursuing the Positive (link HERE), works with individuals interested in lifelong learning and achievement. Mary has more enthusiasm for life than anyone I know; she and Dave are the most loving parents a child could have; and those of us who call them friends are blessed to have them in our lives. It was a magnificent evening at the Texas T-Bone Steakhouse in Grand Island, Nebraska – and no, we didn’t get thrown out. Not even close. At least, I don’t think it was close. Reluctantly, we parted ways with Mary and Dave and spent the night at the Grand Island KOA in Doniphan, Nebraska. The following morning found us eastbound toward home, but with one more stop on the way – the Quad Cities of Iowa and Illinois. After all, it’s all about the journey, not just the destination. The Quad Cities area actually encompasses five cities along the Mississippi River. By the time tiny Bettendorf, Iowa, grew up into the 5th major city in the area, “Quad Cities” was so familiar to the public that “Quint Cities” never really caught on. The five cities in the Quad are: Davenport and Bettendorf (Iowa) and Moline, East Moline and Rock Island (Illinois). 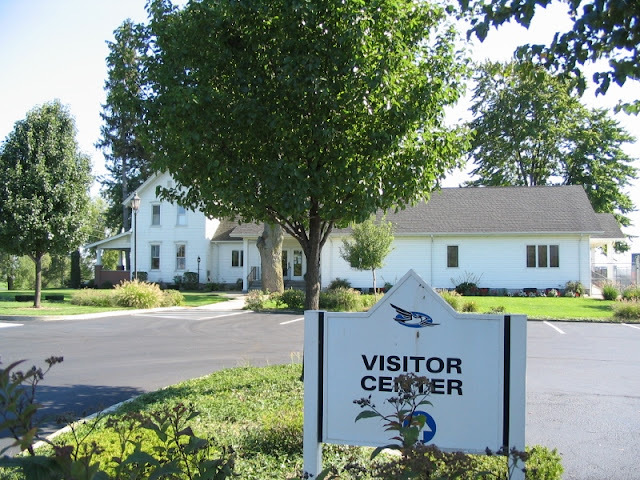 We had a reservation at the Rock Island KOA and we planned a visit to Moline – the home of John Deere. Deere and Company was founded in 1837 by John Deere and Charles Deere and you can certainly find an incredible variety of all things green in this area of the Midwest. 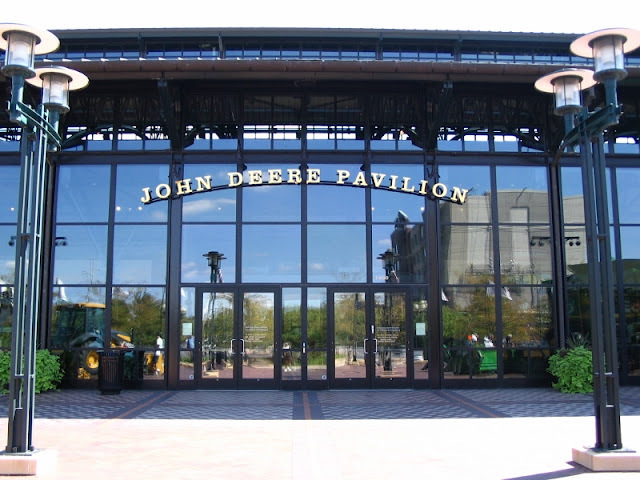 Our destination was the John Deere Pavilion in Moline where we enjoyed playing on the B-I-G equipment and learning a lot of facts about the agricultural industry. I'm not sure I can reach the gas and brake pedals! Had our kids been older, I’m sure we would have taken one of the factory tours – and there are several of them available at different facilities - but there was an age restriction in place. (Really, people, Illinois is not a drive through state – you need to check this out!) In addition to Company Headquarters and the Pavilion in Moline, and the factory tours at various locations, you can also visit the John Deere Historic Site in Grand Detour, Illinois, where John Deere himself created the first commercially successful steel plow in his small blacksmith shop. 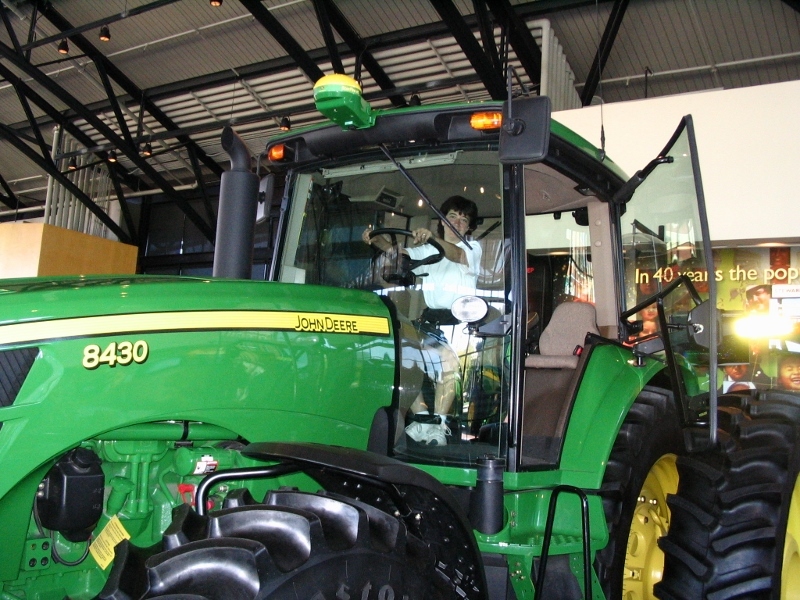 Plus, there’s a Tractor and Engine Museum in Waterloo, Iowa. 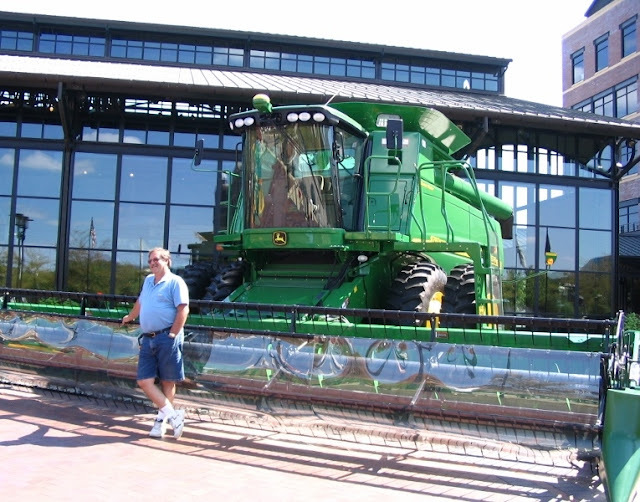 If you plan to be in the Quad Cities area and have a fondness for tractors in that perky green color, be sure to check out the “Visit Us” page on the John Deere web site (link HERE). He's not thinking about buying one of those, is he? Our John Deere adventure in the Quad Cities proved to be the final stop of our National Parks trip. It was a relaxing and fun-filled way to wind down before making that final two day run for home. 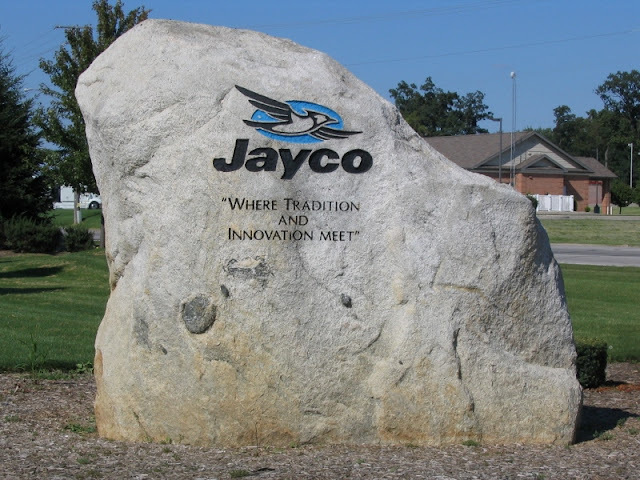 Since we were camping with our Jayco Jay Flight travel trailer, we did detour to the Jayco Visitor Center in Middlebury, Indiana. I love this creative welcome sign! Sadly, the old farm house that houses the Visitor Center is only open Monday through Friday and we cruised through on a weekend. That’s one stop that will need to be moved to another trip itinerary. 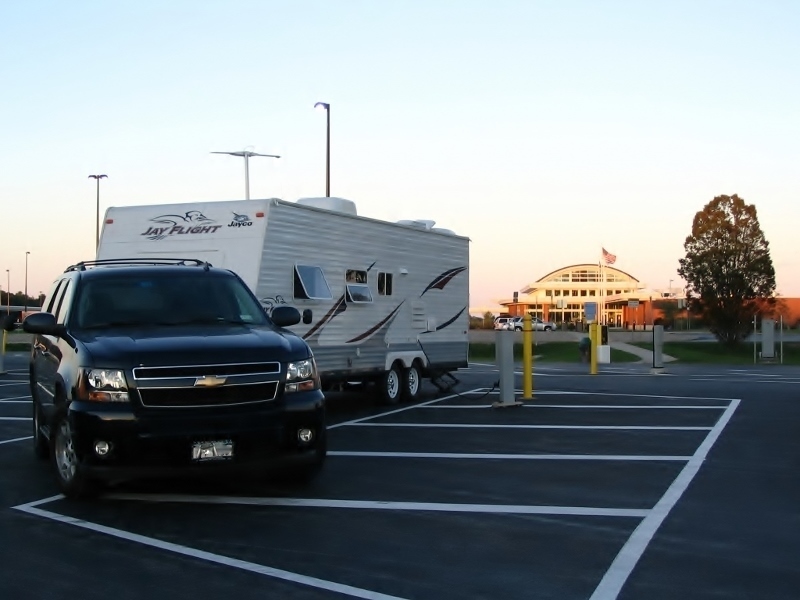 We arrived home after spending our final night in the RV lot at one of the rest stops on the Ohio Turnpike. When Alan and I started planning this journey, it was with the specific intent of re-creating our honeymoon travels with our son and daughter. At the time of this trip, Ryan was 13 and Kyra was 8, and both had proven themselves to be excellent road trippers on earlier vacations. Had that not been the case, we would not have pushed them beyond their limits but, truth be told, we were thrilled that the kids embraced both life on the road and the spirit of the adventure. We covered over 6,000 miles in three and a half weeks in one large SUV and a 240 square foot travel trailer, and nerves became frayed only a couple of times. In a way, we watched our kids grow up before our eyes. The scenery, the adventures, the camp chores and the many experiences this trip offered – all building their confidence, all educating them to become stewards of our public lands - it was the stuff that memories are made of, theirs and ours. And that’s my hope – that the memories of this first cross country journey will remain in their hearts forever, serving as the catalyst for future adventures and reminding our kids that this land is, indeed, their land. Thank you for joining us for our family’s first National Parks trip. Our quest to explore the gorgeous State and National Parks in this amazing country of ours is never ending. I do hope you’ll join us on future journeys and that you’ll come back often to join us for conversation around the campfire – you just never know what the topic will be! Thinking and Driving - No Drinking Involved!